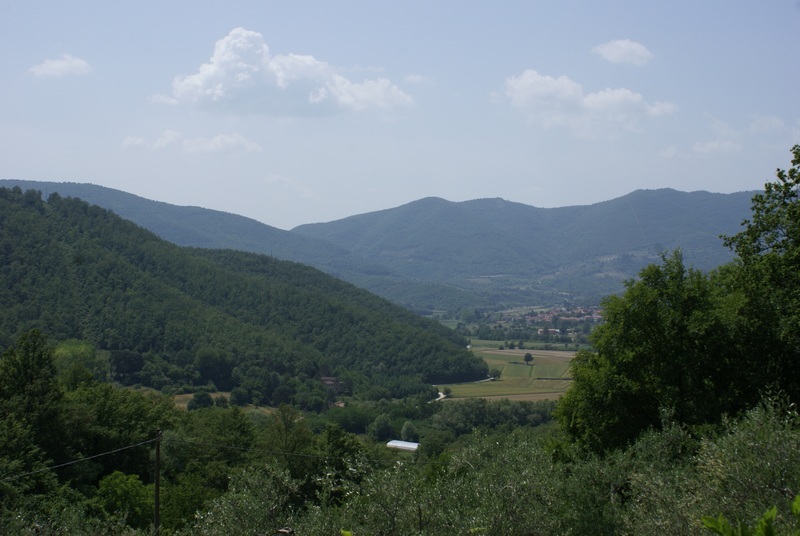 Lisciano Niccone, Umbria – Earthlimited | Earth Limited? Yesterday (21 May) we came to a tiny place called Casa Vacanze Marilena la Cassella, in Lisciano Niccone Commune, Perugia Province, Umbria. Firstly we had to collect our lease car from near Rome airport, and I had to quickly adjust to driving a left hand drive car on the right side of the road on a fast moving motorway. After more than three months of flying, being on trains, being driven to places, this was quite a challenge. But I did well and here we are in Umbria! After all the challenges since we left home on 8 February this is an incredibly welcome, and stunningly beautiful, haven. Last night, with the help of some other guests here, I talked to Guiseppe who owns this place with his wife Marilena. I talked briefly about our journey and my work. There is something very special about the environment here … tree clad hills, small villages, grapes and olive trees in pockets on the slopes, cultivated land on the flats. I am sure that it is not all perfect, but there is a powerful sense of harmony with nature here.